MORE THAN ANY OTHER CARBON BLOCK FILTER! The Multipure Aquaperform Counter Top Water Filter System is recommended for anyone who wants a water filter that sits on their counter as opposed to one that is hidden away under the counter. There are many reasons why you might prefer a counter top filter but the most common one is if you are renting an apartment so do not want to get involved with plumbing or possibly drilling a hole in your sinktop (in the case there is not one already there). Note that all our water filters have the same basic carbon block filter except for this one - the Aquaperfom - which is the only carbon block filter you can buy which is NSF Certified to reduce Arsenic V - and the AquaRO for those who want to filter more impurities at the expense of also removing the healthful minerals. There is no difference between the Aquaperform countertop model and the Aquaperform under the sink model except that one is designed to be hidden away below the counter and the other sits on top of the counter. They filter the exact same contaminants in the exact same way. To compare which contaminants are filtered between the various models please click on this link to see the water filter comparison chart which includes comparisons between the Aquaversa, Aquaperform, and Aquadome water filter systems. This stainless steel model sits on the counter next to the sink and is connected with a hose and diverter valve to your existing faucet. 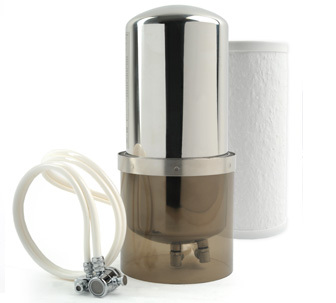 The Aquaperform countertop filter can be converted to an under the sink water filter system with the purchase of a conversion kit. Filter life/capacity is approximately 750 gallons. We stand behind all of our filter systems with a 100% Satisfaction Guarantee! If you are unhappy for any reason within 90 days you can return your purchase for a full refund (minus shipping cost)! And all of our filters come with a LIFETIME WARRANTY on the housing! *Except for our AquaRO reverse osmosis system which requires more frequent filter changes due to its more stringent filtering. BELOW SINK MODEL 880SC NOW! CONFUSED ABOUT WHICH FILTER IS BEST FOR YOU? Click Here For Our Handy Comparison Chart!